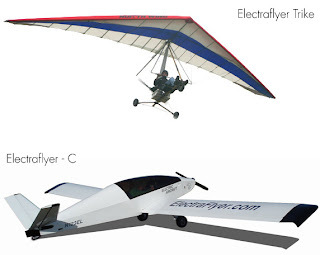 Randall Fishman, the principal of Electraflyer, manufacturer of the Electraflyer Trike ($18,385 complete), a legal ultralight sporting a battery-powered electric engine is currently flight testing an electric airplane from a highly modified Moni motorglider fuselage and wing base. "The main landing gear and tailwheel have been lengthened to raise the fuselage and enhance ground control," says Fishman, who built the Moni in the 1990s with a gasoline engine, and decided, after the success of his Electraflyer Trike, to modify it for an electric engine. 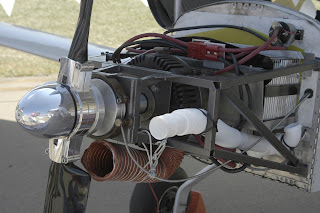 The original two-stroke gasoline engine and propeller were completely removed and replaced with an 18 hp DC electric motor with a controller and regenerative drive attached to a composite, ground adjustable two-blade propeller. The new motor, at cruise, is 90% efficient. The controller is managed by a throttle, and the pilot reads volts and amperes to manage the discharge rate of the batteries. When the propeller is windmilling it can, through the regenerative drive, recharge the battery. Typical takeoff power is 200 amps, which produces a climb rate of 500 fpm. Cruise power is at 33% and produces 70 mph. Powering the machine are two custom lithium polymer 5.6 kilowatt battery packs, weighing 78 lbs. One pack sits in front of the firewall and the other is located in the tunnel that formally held the gasoline engine's exhaus t.
When asked about potential heat issues, Fishman said, "Lithium-polymer batteries, when discharged properly, do not heat up." Just to be extra cautious there is fireproof material surrounding the batteries. Electraflyer-C's test pilot Joe Benis has seen one powered flight last 5 hours, but typical flights on one 6 hour charge is currently one to two hours. The cost of the electricity to fully charge the batteries? Seventy-five cents, U.S. Contributing Editor Amy Laboda is a freelance writer and editor of Aviation for Women magazine. She's an ATP-rated pilot and instrument and multi-engine Flight Instructor with a passion for teaching and flying in light aircraft. Her steady rides these days are a 18-year old Kitfox IV and a fresh Van's RV-10.